Researchers have now identified a select group of foods that provide superior nutrition. These 'superfoods' deliver concentrated nutrition and extraordinary energy to every cell of the human body. They contain the essential amino acids, vitamins, enzymes, co-enzymes, minerals, plant hormones, and phytonutrients that our bodies need to stay healthy. Anyone interested in achieving optimal health and longevity would benefit from consuming these valuable foods daily. 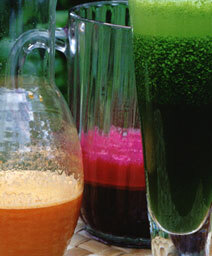 Grass juices, algae, sea vegetables, greens, herbs, fruits and berries are the richest known sources of vital phytonutrients. Superfoods are a combination of these (which you take in water or juice) providing phytonutrients in their natural, synergistic food form. They supply densely packed nutrition that is easily assimilated, intensely nourishing and strengthening to every system in your body, resulting in sustained energy, enhanced recovery, mental clarity and overall well-being.